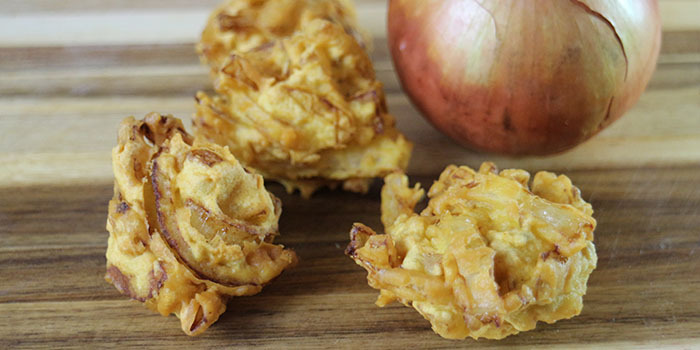 Every Indian takeaway and restaurant everywhere has onion bhajis on its menu. They are a fabulous snack or starter, and really easy to make. Heat oil in a deep-fat fryer or large pan to 180°C (356°F). Peel the onions, slice in half from top to bottom and then cut into thin slices. Cut the slices in half and break them up into individual pieces. Mix together the gram flour, butter and lemon juice. Add enough water to form a thick batter - a bit thicker than double (heavy) cream. Stir in the seasoning and spice and then the sliced onions. Stir well to get all the onions fully coated in batter. With a wet hand, grab a small chunk of onions, about the size of a golf ball, press it into a clump and pop it in the oil. If your clumps don't hold together, add a bit more flour to the batter. Fry for 4-5 minutes, until golden. The video above is from the Keef Cooks YouTube channel. Click here to see the video recipe of Onion Bhaji on YouTube. Gram flour is made from chick peas. If you can't get it, you can use wheat flour, but the flavour and texture won't be the same.